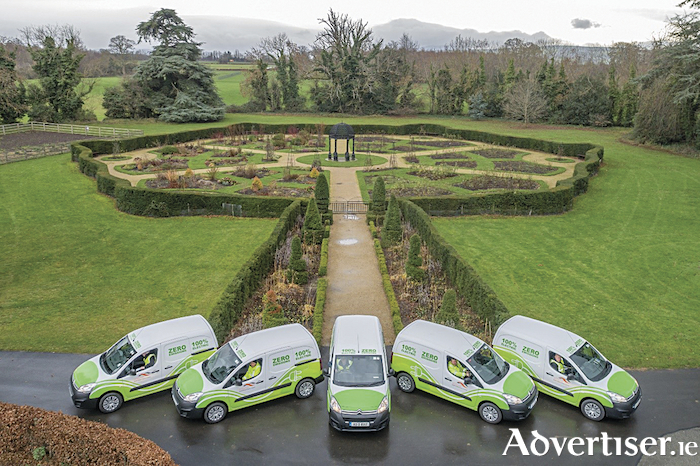 The fleet of five electric vehicles put into service by South Dublin County Council at the Rose Garden, Corkagh Park, Clondalkin. The first of a fleet of new electric council vehicles was launched recently by the Mayor of South Dublin County Council, Mark Ward. “This is our first step in the decarbonisation of our fleet,” said Mayor Ward. “Electric powered vehicles reduce the impact of the council fleet on local air quality. Five dedicated charging points have been installed in a number of the council’s offices and depots. Each vehicle can cover 170 kilometres on a full charge. The vehicles can take 30 minutes to charge 80 per cent of their batteries at fast charge points (DC charger ) or eight hours at regular charge points (AC charge ). SDC currently has 12 public charge points and five fleet charge points, and many supermarkets within the county provide EV charge points for their customers while they shop. The five EVs are now operational and being used across the county. With more electric council vehicles on the road, it is hoped others will follow the council’s example and make the switch to no emission electric vehicles. Fully electric vehicles (EVs ) provide a reduction in air pollution and carbon emissions, promoting sustainability and tackling climate change, while offering whole life cost saving. The EVs have benefits across the environment, financial and operational areas, and they require less maintenance. Electric vehicles also provide superior acceleration and climbing than standard petrol or diesel powered vehicles and offer drivers a quieter and smoother driving experience.